The travel award from the School of Humanities and Social Sciences helped tremendously in covering some of the expenses for my attendance at the Association for Behavior Analysis International (ABA) annual conference. This year, the conference was held in downtown Denver, Colorado. ABA is a premier conference for the field of behavior analysis that addresses how current research is impacting today’s science and human life. I spent two semesters working in the operant pigeon lab with Dr. Adam Doughty for independent study credit. This work contributed to a poster on reinforced behavioral variability that was presented at ABA. In addition to presenting, I attended several symposia and paper presentations on leading research topics in behavior analysis. I enjoyed navigating the conference and tailoring my agenda to fit my current research interests. One of the most important aspects of going to a conference of this capacity, in my opinion, was meeting colleagues and making connections that could be essential for professional development. I plan to apply to Doctoral programs for Applied Behavior Analysis for the 2018 year and I feel that the learning experiences gained from attending this conference will make me a strong candidate for acceptance. Overall, attending ABA was an all-around great experience and learning opportunity. 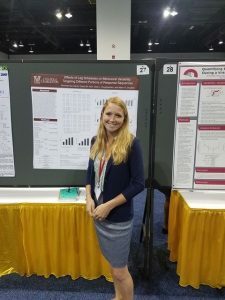 Casey Irwin at the Association for Behavior Analysis International conference in May, 2017. Casey is a senior studying psychology at the College of Charleston.